No. 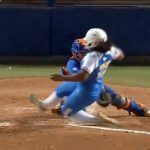 2 Florida Gators softball struggled plating runs all night, so the No. 15 Texas A&M Aggies decided to do it for them. Florida (54-8) scored three runs in the bottom of the seventh Thursday night to walk off with a 5-4 win over Texas A&M (43-17) in Game 1 of the 2018 Gainesville Super Regional. Though the Gators managed five hits on the evening, they went just 2-of-19 with runners in scoring position, including 0-for-2 in the final frame. So how exactly did Florida pull off the come-from-behind win? Trailing by two with one down, junior left fielder Amanda Lorenz (3/3, HR, 2 RBI, R) kicked things off with a solo shot to right field that gave UF a fighting chance. One out later, patience at the plate paid off as Florida put a runner on, and consecutive errors by Texas A&M allowed the next two batters to board the bags as well. With two down and the bases loaded, senior center fielder Aleshia Ocasio walked to tie the game, and senior catcher Janell Wheaton did the same on a full count to see the game-winning run cross the plate on another base on balls. 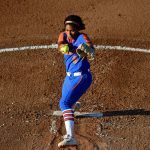 The victory for the Gators was their eighth straight over the Aggies in Gainesville as Texas A&M moves to 0-8 all-time against Florida in Pressly Softball Stadium. The UF victory also marked the first time all season that TAMU dropped a contest when leading after six innings (29-1). 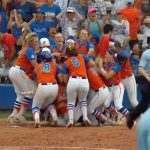 Surprisingly, Thursday marked the first time since 2015 that Florida was victorious in Game 1 of a Super Regional. Game 1 winners have emerged victorious from the Super Regional round 80 percent of the time since the format began in 2005. The Gators are 7-0 in such scenarios. Florida and Texas A&M will tussle again on Friday at 7 p.m. in a game that will air live nationally on ESPN2. I can’ understand why the lady gator softball players look at so many pitches down the center of the plate then swing at bad balls. Where is our hitting coach? We better start hitting tomorrow or no world series.